Electric guitars use coils (guitarists call them pickups or elements) to convert the vibrations of the strings into an electrical signal. 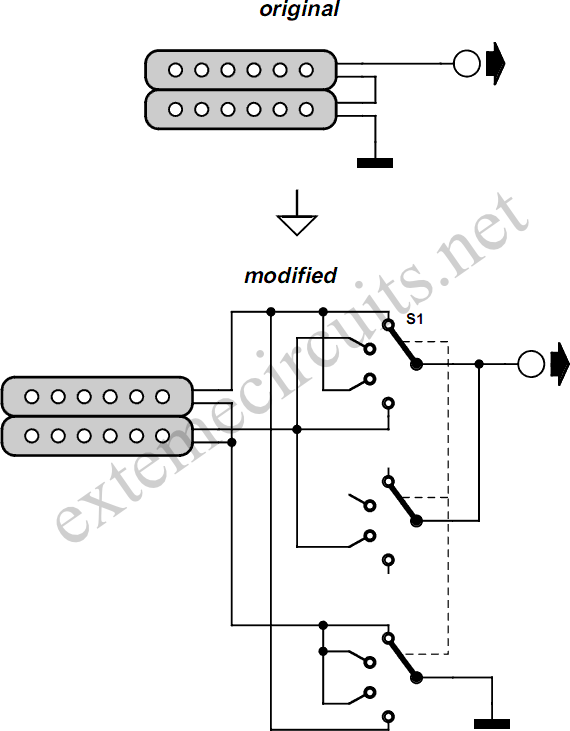 Usually, a guitar has more than one element builtin, so that the musician can select with a switch which element or elements are used to generate the signal. Because of the differences in construction of the elements and the varying positions of where they are mounted, each element sounds different. The elements can be roughly divided into two categories. There are the so-called ‘single-coils’ and ‘humbuckers’. Single coil elements are elements that contain one core and coil for each string. Humbuckers can be regarded as two elements that are connected in series. Many humbuckers have four connections (actually two single-coils with two connections each). These two individual coils are usually interconnected with ﬁxed wiring so that they are always used in series. The circuit proposed here offers the possibility of using a hum-bucker with four connections in no less than four different modes, each of which having its own sound. 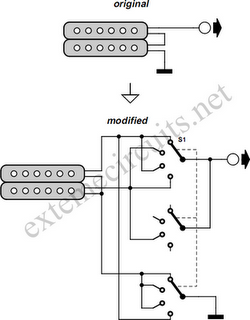 The only things that have to be changed on the guitar are the wiring and the addition of a four-position switch. The latter requires drilling holes in the guitar of course, but if there is a control cover plate (along the lines of a Fender Stratocaster, for example) then it makes sense to put the switch there. This avoids the need for drilling holes in the wood while keeping an (expensive) guitar reasonably unmarred. The schematic shows what the various things look like, electrically speaking, before and after the multisound modification.